Santa Cruz, CA – From low-lying coral atolls and vast jungle archipelagos to the densely populated island cities of Hong Kong, Montreal, Manhattan, and Singapore, the world’s 400,000 islands are incredibly diverse yet their peoples, cultures, economies, and environment are threatened. The need for urgent action to halt and reverse these trends and save our precious islands is highlighted in a publication by Global Island Partnership (GLISPA),Island Bright Spots in Conservation & Sustainability, released today in recognition of the United Nations’ International Day for Biological Diversity dedicated this year to island biodiversity. Island Conservation’s Allen Cay, The Bahamas and Isla Cabritos, Dominican Republic projects are highlighted as successful examples that could serve as innovative models for island restoration around the globe. “Biodiversity is crucial to meet human needs. Our economies, livelihoods, health, and cultures depend on the proper management of this natural capital. This is even more important on islands where natural ecosystems are fragile and easily disturbed. An effective and proven way to save plant and animal species and maintain functioning ecosystems, restore islands, and protect biodiversity is to address the negative impacts of invasive alien species,” said Olivier Langrand, Island Conservation’s Director of Global Affairs, member of the Steering Committee of GLISPA and co-chair of the GLISPA Working Group on Invasive Alien Species.”Island Conservation works with the Global Islands Partnership and world leaders to implement on-the-ground solutions like those highlighted in the Island Bright Spots report. Natural disasters, invasive species, and unsustainable development are drastically impacting biodiversity and economies of islands. These challenges are compounded by climate change. In the Seychelles alone, the economic damage associated with only four key invasive species is approximately US $21million annually. Worldwide the estimated damage from invasive species is US $1.4 trillion annually (5% of the global economy). As we celebrate this International Day, there are many successes to point to and build on. Over the past 20 years, Island Conservation and partners have protected 977 populations of 389 species on 52 islands. Allen Cay and the Small Islands, Big Difference campaign are examples in the new publication of inspired island solutions in action or “Bright Spots” that exemplify how countries around the world can build on what is working to conserve and sustainably utilize our invaluable natural resources, and ensure a future for the planet. As highlighted in the new publication, partnership and collaboration was essential to the successful removal of invasive house mice from Allen Cay. In 2012, the Bahamas National Trust and Island Conservation worked with government, NGO, and private partners to protect Audubon’s Shearwater and improve breeding habitat for the Endangered, endemic Allen Cay Rock Iguana. This successful partnership protected nationally and globally significant biodiversity, and also created conditions and build capacity for future restoration projects in The Bahamas to protect threatened species. Sharing expertise and resources will help conservation practitioners determine where invasive species threaten biodiversity and empower local agencies to invest in the protection of native species on islands. Small Islands, Big Difference (SIBD) is a global campaign to save island species and preserve biodiversity through the removal of invasive species from islands. SIBD serves as a vehicle to inform policy, influence global funding mechanisms, and protect threatened plant and animal species on islands through the eradication of invasive alien vertebrates from islands worldwide and through the prevention of new vertebrate invasions. The goal of the SIBD campaign is to support hundreds of partners in protecting thousands of species through the removal of invasive species from 500 islands. “This Day provides a unique opportunity to showcase the bright spots where islands have shown leadership in a manner that can be scaled up and replicated to achieve global conservation and sustainable development targets,” said H.E. Ronald Jumeau, Ambassador for Climate Change and Small Island Developing States Issues, President’s Representative to the Global Island Partnership and Chair of the Steering Committee. “Nowhere are the threats of extinction higher than on islands, and nowhere else do we have a bigger opportunity to save threatened species. If we do not act now to protect island species, we risk to see them disappear forever in a short time” Olivier Langrand, Island Conservation, Director of Global Affairs. Island Conservation is an international non-profit conservation organization headquartered in Santa Cruz, California with field offices in Australia, the Bahamas, Canada, Chile, Ecuador, Hawaii, Puerto Rico, and Washington DC. The mission of Island Conservation is to prevent extinctions by removing invasive species from islands. Island Conservation prevents extinctions by working where the concentration of both biodiversity and species extinction is greatest—islands. 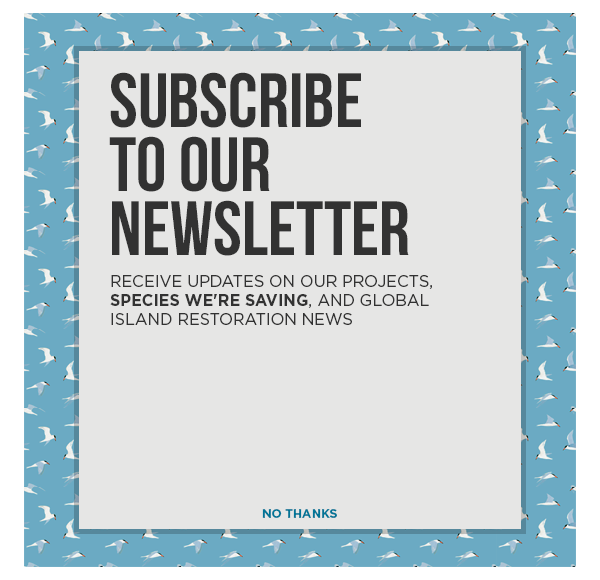 By removing one of the greatest threats—introduced invasive species—threatened native island species and ecosystems recover with little or no additional intervention. Island Conservation works with local communities, government agencies and conservation groups to plan and implement the removal of invasive species from islands and conduct research to understand ecosystem changes from these actions. Mwebaze, P., A. MacLeod, D. Tomlinson, H. Barois, and J. Rijpma. 2010. Economic valuation of the influence of invasive alien species on the economy of the Seychelles islands. Ecological Economics 69: 2614–2623. Burgiel, S., and A. Muir. 2010. Invasive Species, Climate Change and Ecosystem-Based Adaptation: Addressing Multiple Drivers of Global Change. Global Invasive Species Programme.